MacEtch and chips; AI predictive maintenance; superalloys. Singapore’s Agency for Science, Technology and Research (A*STAR) has advanced a technology called metal-assisted chemical etching or MacEtch for use in the fabrication of silicon nanowires and related structures. Silicon nanowires are used in several applications, such as electronics, solar, storage, optical, catalysis, drug delivery and sensors. In semiconductors, the industry is working on silicon nanowire FETs or gate-all-around FETs. A nanowire FET is a finFET on its side with a gate wrapped around it. Patterning the nanowires is challenging, but etching them into accurate and precise structures is daunting. One method is traditional reactive ion etching (RIE). Other processes have been proposed, such as vapor-liquid-solid growth and molecular beam epitaxy (MBE). MacEtch is another method. It enables good control and ordered crystalline nanostructures without damage, as opposed to conventional methods. In the MacEtch flow, a substrate is coated with a resist. 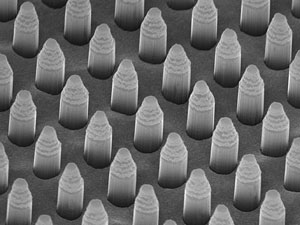 Researchers used two patterning methods–laser interference lithography and shadow masking. Laser interference provides the best results. Then, a catalyst based on gold is deposited on the surface. The catalyst accelerates the etch rate. “This is achieved by accelerating the generation of hole charges when hydrogen peroxide (H2O2) is reduced at the electrolyte-metal catalyst interface,” according to a paper from A*Star in the journal of Scientific Reports. In one experiment, blocking metals based on chromium are inserted between the catalyst and the silicon. The blocking metals are in the form of dot patterns. Then, the catalyst is added. The blocking materials become protected points, which in turn become silicon nanowires. All told, researchers demonstrated that the etching is controlled by a chemical “redox” reaction. “Consistent with the ion transport model introduced, we showed the possibility in the dynamic redistribution of the metal atoms that resulted in the formation of pores/cracks for catalyst thin films that are ≲30nm thick,” according to the paper from A*Star. In a separate development, Japan’s Rohm and Singapore’s A*STAR’s Institute of Microelectronics (IME) are developing an artificial intelligence (AI) chip to boost efficiency in predictive maintenance for smart factories. The chip is targeted for predictive maintenance applications. Predictive maintenance forecasts machine failures. It identifies potential problems based on data from sensors. With the technology, the problems can be corrected. Using Rohm’s AI analytical algorithms and IME’s low-power analog/digital integrated circuit and systems, the research collaboration will enable a chip that will filter volumes of data across multiple sensors. The device will analyze complex data patterns in real-time. “The factories of tomorrow will demand highly intelligent solutions for greater integration of their operations in a seamless network across the value chain. Our joint research with Rohm in developing an artificial intelligence chip is an important step towards achieving greater efficiency in data transmission and analysis necessary for predictive maintenance in the era of smart manufacturing,” said Tan Yong Tsong, executive director of IME, on the agency’s Web site. Meanwhile, A*STAR has developed a new superalloy using a 3D printer. In the experiment, researchers used Inconel 625, a superalloy used in industrial marine applications. This superalloy is based on a 55% to 70% mix of nickel. It also includes chromium, molybdenum, iron, niobium-tantalum and other metals. Using a 3D printer, A*STAR’s Singapore Institute of Manufacturing Technology and Institute of Materials Research and Engineering added titanium diboride nanoparticles to Inconel 625. The resulting particles were about 58nm in size. Then, they created 1mm thick layers. The layers were applied on a carbon steel substrate measuring 120 × 70 × 10 millimeters. “We show that adding nanoparticles to the metal base material is an effective way to tailor the material with significantly improved physical, thermal and mechanical properties, as well as excellent performance in terms of wear and corrosion resistance,” said Guijun Bi, a researcher from A*STAR. Tags: A*Star Agency for Science Technology and Research IME Rohm Scientific Reports.